A spot of culture for today. North of Carcassonne and at the eastern end of les Montagnes Noires, is the reasonably precipitous valley of the river Orbiel. 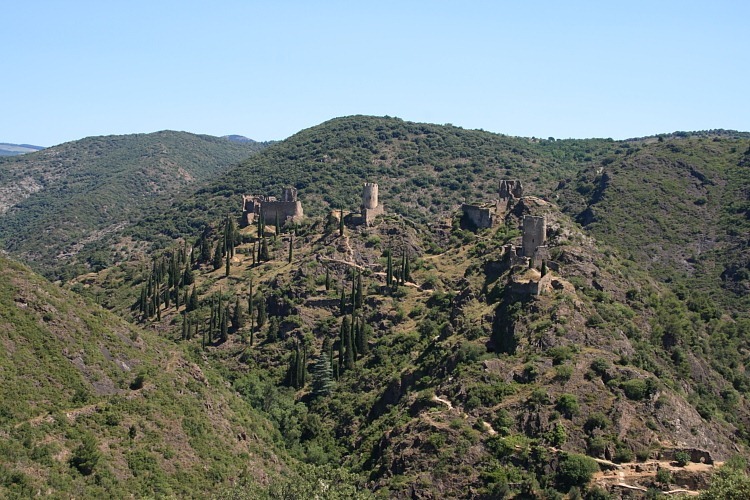 About half way up the valley is the village of Lastours boasting an unusually large number of châteaux for one small village: four. The royal troops destroyed the village and original castles but built three new ones in different positions. Weird! The king “asserted his supremacy” [it says here] by building a fourth castle. Weirder! [Ed: you can never have too many castles, I say.] It is the ruins of these that we now see, and very impressive the sight is, too. You can, of course, clamber up paths to get a good close look at the stones from which the castles are constructed. Not being interested in stones, I can rarely see the point in so doing, though. In my view, attractions such as this are much more impressive when viewed from a more distant vantage point. Fortunately, some similarly minded person has constructed a belvedere on the opposite side of the valley which, for the princely sum of €2, provides this excellent view.